Need For Speed: Hot Pursuit is the 16th instalment in the long-running Need For Speed series of racing games, developed by Criterion Games and published by Electronic Arts. This game is not to be confused with the original Need For Speed III: Hot Pursuit, which was released in 1998. The instalment is described as a "revolutionary" addition to Need For Speed and is supposed to capture the nostalgic style and feel of Need For Speed: Hot Pursuit, while containing more advanced gameplay and modern graphics. This is also the first NFS game to use the Autolog, a feature that acts as a social networking system for the game, allowing players to challenge their friends, get the latest news and download DLCs. Hot Pursuit 2010 is also a BAFTA Award-winning in the category "multiplayer". The game was first hinted at during E3 2009 by EA's CEO, John Riccitiello. 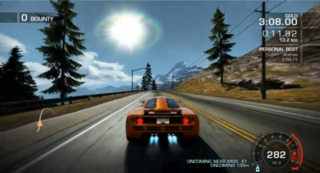 Hot Pursuit was well received by critics at E3 2010 and was most notably awarded with "Best Racing Game" from the 2010 Game Critics Awards as well as several other media outlets. 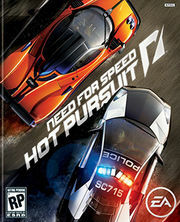 Upon its release, Hot Pursuit was met with high critical acclaim averaging 90% on both review aggregate websites Metacritic and GameRankings, making it the highest-rated game in Need For Speed series history and one of the seventh generation's highest-rated racing games. It won several Best Racing Game awards, including Best Driving Game at Spike's 2010 Video Game Awards. Reviewers praised the game's graphics, visuals, crashes, sound and soundtrack, excellent presentation, dramatic races, high-speed chases as well as the new Autolog feature and that it brought the series back to its roots. According to EA, the game has sold more than 8.5 million copies on all platforms combined. The game shipped in two editions, the normal one and a Limited Edition, which comes with two additional cars: the racer version of the Alfa Romeo 8C Competizione and the racer version of the Ford Shelby GT500. With this version the players also has early access to 4 cars: the racer version of the Chevrolet Camaro SS and Audi TT RS, and the cop version of the Dodge Challenger STR8 and Porsche Cayman S.
High-speed police chases and exotic cars, the defining elements of Hot Pursuit, are definitely featured. Primarily inspired by the original Need for Speed on 3DO, it'll feature full career modes for both racer and cop, with both sides having their own power-ups such as calling for roadblocks and radar jamming. It'll also include a social networking feature dubbed "Autolog". An experience system called "Bounty" has been confirmed, although this is unrelated to the bounty seen in Need for Speed Most Wanted (rather, it is used to extend your SCPD cop rank or wanted level, unlocking new equipment, cars and other things on the way). There are three bounty reward categories (racers/cops): gold/distinction (by finishing first or passing the initial time limit depending on the event), silver/merit (finishing second or passing second time limit) and bronze/pass (third place or final time limit). Criterion has described it as more realistic than Burnout Paradise, but less than a simulator, such as Need for Speed SHIFT. Free roam is also available, however unlike in previous installments, the police do not chase you in it, but it is merely for exploring and taking snapshots. There are 20 levels to each side (cops and racers), the highest being "ultimate enforcer" and "most wanted", respectively. Players can add custom soundtracks to the game in the PS3 and Xbox 360 versions, but this can't be done on PC and other platforms. The game features no customization, only paint jobs, thus staying true to NFS's roots. The Wii version, however, has the same customization system carried over from Need For Speed: Nitro. Cockpit view is also absent. Each side has its own weapons that they can use against the other. The weapons range in levels, each higher level being more effective and damaging to the opponent. The game also has a rear view mirror for the car you are driving, in order to keep track of the cars behind you and place spike strips as well. It is worth noting that although Ferraris made a comeback for the first time in the Need for Speed franchise in seven years as part of a Need for Speed SHIFT DLC, they are once again absent in this game, unlike the previous two Hot Pursuit titles. However, the game exclusively features the Porsche 918 Spyder. A screenshot of the game, taken from "The Ultimate Road Car" preview race featuring the McLaren F1. Radar jamming: Or simply just "jammer", it allows you to disable the police radar for a limited period of time, disabling their map and rendering them unable to use any attacks. This also terminates any EMPs they have locked on you. The higher the level, the longer and more efficiently it works. Spike strips: Can be placed behind a police vehicle. If hit, the cop car will be slowed down and damaged. Exact amount of damage depends. The higher the level, the longer and wider the spike strip will be, as well as the ability to scatter multiple. Turbo: Gives you a sudden and extreme boost of speed that can be used to overtake other racers, cops and evade EMP attacks. They work best on straights when you are already significantly in front, otherwise you risk crashing or getting hit by a spike strip. The higher the level, the faster it lets you accelerate and for a longer time. Electromagnetic pulse: Referred to by its abbreviation "EMP", this allows you to lock on a target and after a few seconds strike them with a high-intensity, short duration burst of electromagnetic energy. It works best when it is hit when your opponent is making a turn, however it is best to know the route, as a sharp turn, shortcut or even your rival simply accelerating faster can cause you to miss. The higher the level, the more damage it causes and the less it takes to lock on. Roadblocks: Allows you to call for a roadblock to try and slow down the racer. There is, however, a gap that the speeder can aim at to escape. Spike strips: Can be placed behind a racer's vehicle. If hit, the car will be slowed down and damaged. Exact amount of damage depends. The higher the level, the longer and wider the spike strip will be, as well as the ability to scatter multiple. Helicopter: Allows you to summon a police helicopter. Although they initially have a limited amount of fuel, they last for a fair amount of time and are good at following the target. Once they reach a suitable point, they will drop a spike strip for the target to hit, or in some cases (shown in the cutscene), they can drop a spike strip right on top of the speeding vehicle, causing extra damage. Once a higher level is unlocked, the police helicopter is able to last longer and follow the suspect even when they're under a tunnel. The Need for Speed Hot Pursuit demo was released on October 26th, on the PlayStation Store and the Xbox Live Marketplace. Players got a chance to try out the new Autolog system and get 500 bounty in the full version. The PC version was not released. The demo ended on November 9th. A map of Seacrest County. 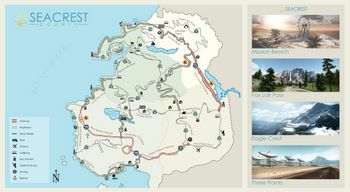 Need For Speed: Hot Pursuit is set in Seacrest County, an entirely open world map which is four times larger than Paradise City, seen in Burnout Paradise. The police department in the game is dubbed SCPD (Seacrest County Police Department). With its vast open-world, Seacrest County is the perfect place to get your fix for high-speed racing (or chasing) action. There are several diverse locales throughout – coast, desert, forest, and mountain – with unique features to provide each side of the law with certain benefits and challenges. One strong suggestion we'd make is to drive around the county a few times on your own before taking part in any pursuits. Get familiar with the beautiful scenery and its many hidden shortcuts.